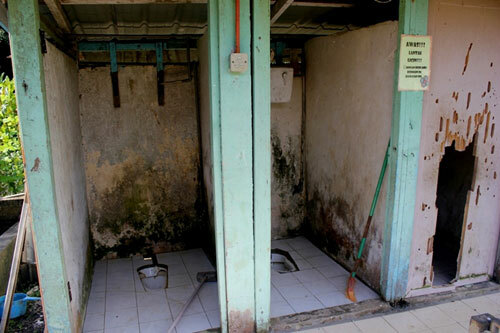 DISGUSTING: The students’ toilets of SK Lubok Mawang in deplorable condition. Two years ago, at the age of seven Sabai had to leave her longhouse and the care of her parents to enroll at a primary school about 30-minute longboat ride from her village. At such a tender age she had to leave the comfort of home to live in a dormitory for the sake of education. Sabai took up the challenge without batting an eyelid because that is a stark reality in many upriver areas in Sarawak. Every kid in her village is living the same life. All her classmates are like her, leaving home at young tender age, living on their own. She never complained about having to do her own laundry or having to look after herself during the weekdays. Weekends are special because her father Sibak who is a farmer would come to fetch her home. That is the time when she will be feel special as everything that her mother Pauline prepared for her and her siblings has “a personal touch”, something she yearned for when she was in school. Sabai is happy with her life, far away inland where rivers connect her to other places. She enjoys coming home every week; the weekly boat ride to school and the fun time playing and chit-chatting with her friends in school. Their dormitory was constructed long time ago. It is wooden, old and no longer firm. Walking on the planks caused the floor to creak, despite the fact that Sabai only weighs 29 kgs. Two years ago when Sabai and her schoolmates forgot themselves and run playfully around in their room the whole building shook. That experience frightened them and they have refrained from doing so again without the warden having to tell them so. Sabai’s classroom is not much better than the boarding building but she does not seem to notice. What bothered her from the very beginning was the school toilets, with its old squating facilities and stained walls and doors that are about to fall. But for young Sabai who is young and flexible, she gets use to it and has been using them daily without feeling disgusted. Meanwhile, for Sabai’s mother Pauline, sending Sabai on the first day to school was the most difficult. She could still remember how Sabai looked at her longingly when she forced herself to walk away from her child. She lost sleep that night, wondering how seven-year-old Sabai would fare without her by her side- would Sabai be bullied? Were the teachers trustworthy who would protect her Sabai rather than hurting the small child? Would Sabai be able to learn well? Would Sabai be given enough food? Sabai’s dormitory seemed shaky, was it safe for her to stay there? While Pauline was losing sleep, Joseph was silently praying. May the Almighty God keep his daughter safe and protect the young child when he could not be there for her. There are many of Sabais, Paulines and Sibaks in our rural areas. I have Iban relatives coming from that background and going through the experience. Even until now, they had not complained about how tough life was or how dilapidated some school were. Blessed with a vast land area, there are many small settlements in the interior of Sarawak, reachable only by rivers and logging roads. Education for rural children is a luxury, paid with the price of staying in boarding school starting at six or seven years old. While rural parents are willing to part with their young children for basic education, their sacrifices were often not reciprocated by the authorities in providing these children with good facilities and infrastructure. Many schools in rural areas were built in the fifties and sixties and not meant to last that long. A lot of them suffering from years of wear and tear are on the verge of collapse. However, as there is no allocation of upgrading or construction of new building blocks, year after year, the children are still placed to learn or stay under unsafe buidlings in the rural areas. It took a bad accident to get the authorities to acknowledge that need when the verandah of the girls’ dormitory of SK Punan Ba collapsed, causing injuries to 18 girls, five of whom were seriously injured. Though RM2 million was allocated within a few months for the rebuilding of both girls’ and boys’ dormitories, the project has been delayed for more than six months, and in the meantime, boarding students are forced to cram like sardines in small spaces in spare teachers’ quarters to continue their studies at SK Punan Ba, a school about one hour boat ride away from Belaga town. Following the SK Punan Ba incident, Assistant Culture and Heritage Minister Liwan Lagang disclosed another shocking fact that there were many more schools in the rural district of Belaga that had been neglected. Hulu Rajang MP Wilson Ugak Kumbong pointed out that in his constituency which included Baleh and Belaga, more than 30 schools were in dire need of urgent repair. He cited Lubok Mawang primary school in his constituency as an example . What is even more frustrating is a few months down the road, Telang Usan assemblyman Dennis Ngau sent another shockwave that the students of SK Puyut, near Marudi, had been taking baths in a nearby pond due to unreliable water supply. Parents and children in the rural areas have sacrificed so much in their quest for education, the least the government can provide is good facilities and safe buildings. With recent 2014 Budget approving RM450 million for school upgrading and repair alone, it is hoped that a large chunk would be given to upgrade rural schools and provide infrastructure for the young children of the rural areas.